Credit: Schmidt Ocean Institute/Kirsten Carlson. Download this image (JPG, 55.9 KB). [24-Feb-17] The HyperSAS radiometer follows the angle of the sun and measures the color of the sea through a downward looking lens, and the color of the sky through another lens pointed upward. 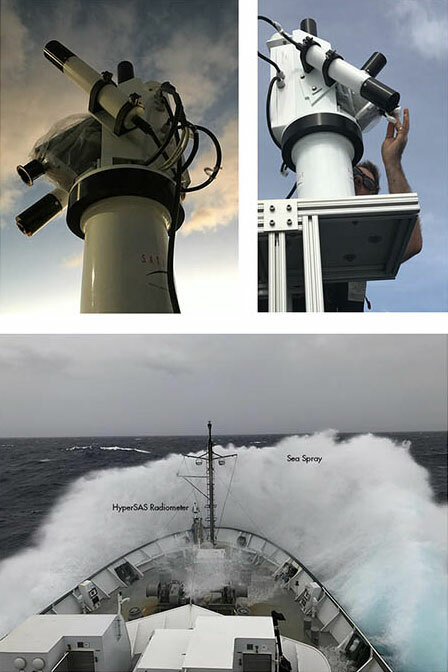 Scientist Ryan Vandermeulen must periodically clean the lenses of the HyperSAS Radiometer because of sea spray.